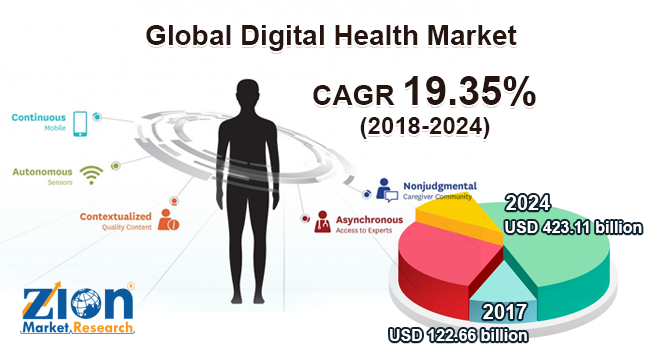 With the presence of a large pool of participants, the global digital health market is displaying a highly competitive business landscape, finds a new research report by Zion Market Research (ZMR). CONMED Corp., Olympus Corp., Fujifilm Holding Corp., Boston Scientific Corp., Cook Medical Inc., Covidien Plc, Stryker Corp., and Smith & Nephew Plc are some of the key vendors of endoscopy devices across the world. These players across digital health market are focusing aggressively on innovation, as well as on including advanced technologies in their existing products. Over the coming years, they are also expected to take up partnerships and mergers and acquisitions as their key strategy for business development, states the digital health market study. Citing an instance, recently, DarioHealth – a leading Israel-based digital health firm offering mobile health and big data services – declared that launching of version 4.1 of its Dario® App for Dario Blood Glucose Monitoring System, which is a part of its digital diabetes data management tool. Reportedly, the app that is available through both direct-to-consumer tool and healthcare service providers is now fully integrated with the DarioEngage patient management & coaching tool. As estimated in this report, the global digital health market stood at US$ 122.66 billion in 2017. Witnessing a tremendous rise during the period from 2018 to 2024, the revenue in this digital health market is expected to reach US$ 423.11 billion by the end of the forecast period. The main product types available in this digital health market are healthcare information systems and wearable devices. Among them, the demand for healthcare information systems is relatively higher and the trend is anticipated to remain so over the next few years, notes the digital health market research report. “Growing need to improve the efficiency of healthcare service delivery with prominent increase in chronic ailments along with favorable government policies as well as initiatives taken by healthcare firms will impel digital health market trends in the coming years,” says the author of this study. Apart from this, growing preference of firms to develop new products is likely to open new growth vistas for digital health market in the years ahead. Regionally, North America has been leading the worldwide digital health market and is anticipated to continue on the dominant position in the years to come, states the digital health market study. Rise in the number of initiatives taken by government organizations and healthcare communities for spreading awareness about digital health importance among the global population is the main factor behind the dominance of the North America digital health market. The high number of market players being headquartered in North America is another significant factor that is supporting this regional digital health market.